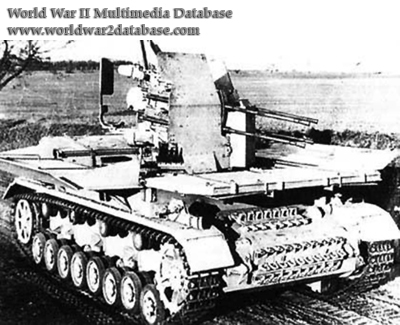 Prototype Mobelwagen (Furniture Van) Flakpanzer (SdKfz 161/3) armed with quadruple 20mm (.78 caliber) automatic cannon. Only one of these prototypes were built and shown to Reichskanzler Adolf Hitler on December 7, 1943. The production vehicle had a single 37mm (1.46 inch) cannon. With the Allied invasion of France imminent, Hitler ordered all mobelwagens sent West. Slated for first twenty and then thirty vehicles produced per month, it was expected to be an interim solution but remained in production through the end of the war, with 240 built. The open platform was protected by four armored shields that could be raised if needed, but prevented the gun from rotating a full 360 degrees. The high sides gave the mobelwagen its name - the high sides reminded soldiers of a moving van. Prototype 37mm Flak Panzer IV "Mobelwagen." Panzerkampfwagen IV ausf H (SdKfz 161) of 3.SS Panzer-Division "Totenkopf"